Carbon monoxide may be a colourless and odourless naturally occurring gas, but as most people know, this still doesn’t make it safe! Every year, an average of 50 Canadians (11 Ontarians) die from carbon monoxide exposure, according to the Ontario Association of Fire Chiefs (OAFC). More Canadians succumb to the effects of carbon monoxide poisoning during the winter season than at any other time of year. With statistics like these, carbon monoxide is one indoor air quality concern you clearly can’t afford to overlook! In this post, we share timely tips for how to protect your home, yourself and your family from carbon monoxide poisoning this winter. Carbon monoxide, or CO for short, occurs naturally during the process of combustion. It doesn’t matter what you are burning, how much of it you burn or how often you burn it. Any type of fossil fuel—wood, gasoline, coal, kerosene, natural gas, propane, charcoal, oil, tobacco—will produce carbon monoxide when ignited. This is because all fossil fuels contain both carbon and hydrogen and perfect combustion with no by-products is virtually unheard of. In a perfect world, of course, carbon and hydrogen would combine to produce carbon dioxide and water only (“complete combustion”). In the real world, however, inefficient fuel use produces not just carbon dioxide and water but also partially oxidized carbon. This is CO—carbon monoxide. While most appliances cannot achieve pure complete combustion even when meticulously maintained, such appliances can come close enough to meet national safety standards. The National Fire Protection Association (NFPA) states that 0 to 50 parts per million (ppm) is the only level that will not produce health symptoms in people. “Incomplete combustion” can occur for a variety of reasons, but the most common reasons are poorly maintained appliances and inadequate indoor air ventilation. Carbon monoxide is colourless, odourless, tasteless and does not cause any irritation to the skin or mucous membranes. This makes it very hard to detect, even at toxic levels! The main symptoms of toxic carbon monoxide exposure include headache, dizziness, nausea, vomiting, loss of consciousness, brain damage (often irreversible) and death. Symptoms of carbon monoxide exposure and poisoning can build gradually or come on suddenly depending on the level of exposure. At 200 ppm, you may develop a low-grade headache after an hour or two. At 12,000 ppm, you may die within 3 minutes. Since carbon monoxide is a naturally occurring gas in the presence of fossil fuel combustion, it is nearly impossible to completely avoid exposure. This is especially true since CO is also present in secondhand tobacco smoke and automobile emissions. However, it is possible to control your exposure and prevent carbon monoxide poisoning. Install and maintain a certified carbon monoxide detection alarm. Improve the ventilation throughout your home space (including garage, workshops, attic, basements). Schedule routine safety inspections and preventative maintenance service for all fuel-burning appliances. 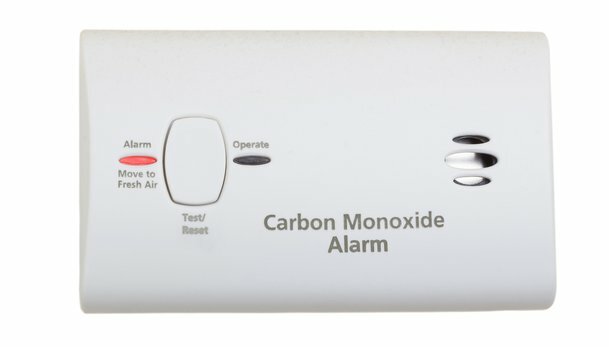 The best way to detect carbon monoxide inside your home is to install a carbon monoxide detection alarm. You will want to be sure the alarm you install is certified by an organization approved by the Standards Council of Canada. Look for a certification seal such as UL, CSA, Intertek or something similar. The Ontario Association of Fire Chiefs now requires CO monitors be placed near each sleeping area or room inside a home or apartment. The CO monitor can be powered by batteries, a plug or hard-wired. You should test your CO monitoring system monthly at the same time you test your smoke alarm detector. Our sister company, Shipton’s Heating & Cooling, visits hundreds of homes and worksites annually year-round to perform routine safety inspections and preventative maintenance on heating and cooling appliances and equipment. This simple preventative service is designed to catch small issues before they become major outages or human safety concerns. All safety inspections and maintenance service calls include routine testing and cleaning of the wiring, pilot or other source of ignition. Ventilation is the process of removing stale or toxic indoor air and replacing it with fresh oxygenated air. In past decades, before the advent of green airtight building practices, homes typically allowed for some level of natural ventilation through existing cracks, gaps or leaks. But today’s homes are built to be so energy efficient and airtight that Ontario’s SB-12 building code now requires all new construction homes to include installation of a heat recovery ventilation system to provide ventilation mechanically. This illustrates just how vital adequate indoor ventilation is to your health and safety. Heat recovery ventilation systems use two separate air pathways to move stale air out of your home and draw fresh oxygenated air into your home. These appliances also work to balance seasonal humidity changes and remove toxins like carbon monoxide from your home space. A heat recovery ventilator, or HRV, can be retrofitted to work with any existing central (ducted) HVAC system so you don’t need to upgrade your heating and air conditioning equipment. Here at Clean Air Solutions Hamilton, we live, eat and breathe (literally) indoor air quality! Right now, take advantage of our seasonal indoor air duct cleaning sale and save 10 percent on any of our popular professional air duct cleaning services! To schedule your annual safety inspection and preventative HVAC maintenance service, call our sister company, Shipton’s Heating & Cooling, at 905-549-4616. For help improving the ventilation inside your home or workplace, contact us online or give us a call at 905-544-2470.